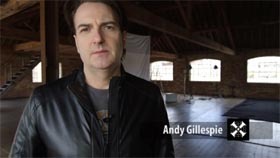 An interview with Jim, Charlie and Andy about the Big Music album and its key songs. Interestingly the title card is "The Album" suggesting that it was later renamed "Band Interviews." (And in earlier times, this would've been called the EPK). JK: " I think what's making us happy the most about the new record is – apart from the melodies and apart from the words and apart from the emotions – is the structure. 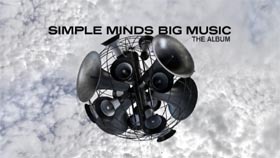 We needed an album that really showed that Simple Minds were – first of all vibrant – the idea being we're nearly forty years down the road and still coming up with new stuff is in itself is fairly unique. " JK: " I think one of the things that influenced the sound of the album was that a few years ago the band went out on a tour called 5X5 where we essentially played five songs from our first five albums – which is almost a non-hits tour, if you exclude some of New Gold Dream. We know that you can't go back, the past is the past and the world has changed, technology's changed, we have changed, but you kind of riff off your early work, you kind of look at your own work and it can remind you of certain things, certain feelings, certain emotions, even taste for sounds – it can remind you of how you were first inspired by those things. " CB: " I think the record's quite poppy. Normally we would get a balance on certain things and some tracks on this we haven't even bothered doing that as we feel that strong melodies are what they are. " CB: " And it's great to let go like that. Especially after so many records where you tried so many different styles and different sounds and things, it's really difficult to get something that's kind of feels novel and challenging for us – but with this record I think we got it. " JK: " I think the first track many people will hear from the new album, in fact some people have already heard the track called Blindfolded because we've been playing that live, although there might be more – many more commercial tracks – I think Blindfolded is the track with the most magic, the most artistry, I think it's the most unique track. " CB: " I totally love the chorus riff – the chorus guitar riff. To me it's quite punky and there's a bit of an edge to it. It's very contemporary even though it's very retro in a way. I like that. And I just love the atmosphere of that track. " JK: " And in a sense it's a track that got things going because we decided three years ago to get in touch with Steve Hillage who produced our earlier albums and we hadn't seen Steve for decades so we thought 'let's just get the ball rolling.' We weren't quite sure at that stage whether we were recording or not but we thought 'let's go in with Steve.' "
JK: " What was amazing was when we worked with Steve all those years ago – at the time the whole of the UK seemed to be on fire. It was the time of Margaret Thatcher and there were riots in Toxteth and Birmingham and London itself where we were working at the time on Sons And Fascination was the scene of riots and all of this stuff. And here we were, about three days into recording, decades later, and you had the riots in Tottenham – just actually half a mile down the road from where we were in Notting Hill Gate. A lot of that scene had caught on as well. So we were going out in the middle of the night, and there were police cars everywhere, people running to and fro, and of course, our heads were full of music. It's was just like the world hasn't changed. It's like all those years after we made Sons And Fascination we were walking into the same scenes. Not only did it seem that the world had not changed, catching up with Steve after all these years, it didn't seem anything had changed either. 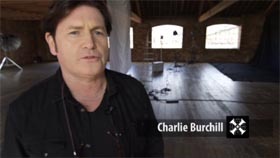 He certainly hadn't lost any of his enthusiasm and Charlie and I's desire to continue being creative was wholly still intact and, if you listen to Blindfolded then I would hope that that comes through. " JK: " I'm pretty confident whoever hears this album, particularly people who like the album - I'm pretty confident that one of the highlights will be Honest Town. " CB: " We're doing a song called Honest Town which is a collaboration with Iain Cook from Chvrches. Beautiful song, really, really emotional. " JK: " Iain was introduced to me by a great associate of the band called Martin Hanlin. He introduced me to Iain probably about four years ago when Chvrches was just coming together. And at the time I was spending more time in Glasgow than normal because – unfortunately – my mother had been suffering and she was coming towards the end of her life really. And I wanted to be around as much as possible. However, she wasn't quite keen about me sitting around doing nothing –she would much rather that... She was happy to see me but she wanted to know that I was working, that I was pushing on, that I was inspired and conveniently Iain was situated half a mile away – so we got together and it was just one of these things that just clicked and we ended up writing about ten to twelve songs maybe. One of the first melodies Iain played me was the riff for Honest Town. When I heard it instantly there was something about the emotion in it that really grabbed me and it was an emotional time for me anyway – you know thinking about the backdrop and being back in Glasgow and the reason why. " 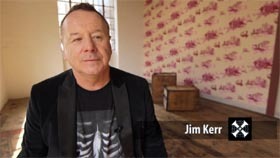 JK: " The lyric itself was a phrase my mother used in one of the last conversations I had with her about a week before she passed away, we... the whole of the UK was covered in the worst snow storm, the worst weather circumstances that the country had seen for decades – and Glasgow itself had ground to a standstill. Everyone was saying 'Don't go out unless it's absolutely necessary.' The snow was up to... whatever. But my mum had it in her mind to go out in what became the last time. " JK: " We had this really magical trip actually. She wanted to go through town... she wanted to go for a drive through town. 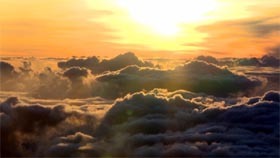 My Dad wasn't keen on taking her – he was afraid of what the weatherman was saying. But I said 'Let's go' and it just happened in circumstances that the journey we went on was all landmarks of her life and indeed my life of growing up in Glasgow. And you know how it is anywhere when it snows and everything grinds to a halt and the place becomes dreamlike and it becomes really static – apart from the occasional falling snow and it was like we had the world to ourselves and obviously driving very slowly and she was talking away – she was talking about her childhood, she was talking about the city she grew up in, she was talking about ourselves, our family as kids and stuff, and in the course of this conversation the phrase "Honest Town" just came up. She used it. And when I went along to Iain's studio later that night, I said to him 'I think I've got a lyric for this' and it's one of those songs that... we always say that the great songs almost seem to write themselves and they fall together in minutes and that was the case with Honest Town. " JK: " One of the greatest things for me in the period of the last album, Graffiti Soul, was that I worked on this solo project called Lostboy. And we only worked on it for a few weeks, and toured it for a few weeks. 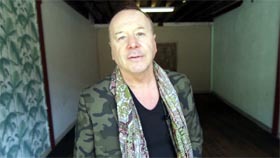 And one of the things that was great about it was it was people coming into my life, other writers and stuff, that energised me and indeed have gone on to energise Simple Minds. And one of those people was Owen Parker. " JK: " Owen came up with this tune that had something about it – had something of the nostalgia about it. I always liked these park songs – MacArthur Park, Itchycoo Park and stuff – and there was something about this song that the phrase Broken Glass Park came up. I mean it is pure nostalgia about the area that Charlie and I grew up in and when we were young kids we used to escape into the park and when we were teenagers we would escape into it at night and – I won't go into details about what happened there – but this park became central to our lives and Owen really did us a great, great service – well, he gave me a great, great service in feeding me that melody. " JK: " The title track itself, Big Music, which is another Andy collaboration – Andy and Charlie – but this time the track goes back to... I think the music's almost ten years old – or the riff is. It was always good but I could never quite come up with a lyric I felt was good enough. " AG: " And we were working on it in Ireland – just the three of us actually. And I came up with some synth stuff and we pushed and pulled it around quite a bit – I'd been working on the track before with Charlie. " JK: " I'd got a weekend off that I was really looking forward to – in fact I went to see Prince play in Monteux. Meanwhile Andy was left working on the music and I said 'By the time I come back, I'll have a lyric. I'm sure about it.' I don't know where I got the confidence from but I'll thought go and see Prince and I've have an amazing time. So I went to see Prince and he's Prince and he's great but I was very frustrated because he never played any of the songs that I wanted him to play. I know the feeling quite a lot – people come to see Simple Minds and say 'Well you never played this or played that' but Prince literally never played any of the songs I wanted to hear. And I was enraged – I was furious. I could understand the artistic side of it but as a punter... I remember standing during the gig and just thinking 'Give me the music. Give me the songs. Give me these songs that make me feel ecstatic. Give me these songs that change my world.' Because Prince is one of these artists that indeed could lay claim to that. " JK: " Anyway, by the time I got back to Ireland, I'd scribbled all these lines listening to the backing track of what became Big Music. " AG: " He went in and he'd basically cut his lyrics and the vocal in one take. It was fairly obvious that there was something special happening there. " JK: " And I was quite happy by midnight on the day back that we'd nailed a lyric and a tune that finally seemed to match and go together well. And really it's just about a passion for music, for playing music, for listening to music and in our case, growing up in within this life of music. " JK: " A few years ago I was on holiday – it was on the other side of the world actually, I was in Indonesia – and I woke up in the morning and –as you do – I checked the e-mail and there was this MP3 from Charlie for a track he had titled Human. There's a lot of tracks called Human - I don't think I'd have particularly chosen it but within a few minutes I was already inspired to go to work on it. " JK: " There's a song on the album called Let The Day Begin and it was written by Michael Been of a band called The Call. Some people will know them but I think – by and large many people this side of the water don't know about The Call or Michael. " CB: " And they toured with us in America for quite a long time. And he's an amazing writer – he had an amazing pedigree. He was in Martin Scorsese's Last Temptation Of Christ, he was an apostle in that – Martin Scorsese directed the videos, his backing band was The Band – I mean, that's not bad. And he was just an amazing writer. " JK: " Years later – so many years later – in fact last year, we got the chance to go back and tour in America and in that time, sadly Michael - fairly recently, had passed away, very sad. But we'd have loved the chance to hook up with him again or the chance to play with him again – but it wasn't to be. So on the last tour of the States indeed we played Let The Day Begin. It went down an absolute storm and sounded better than we ever imagined that it would. Pretty much within about twenty-four hours since coming back to these shores and landing at Heathrow we booked the studio in London and tried to capture it. " JK: " It's great to have it in the set, and great to have it on the album, and hopefully it's a great homage to Michael as well. " No promo or standalone versions of the video have yet surfaced.